Samsung, Motorola and Apple are the three smartphone giants in the world. Now this competition goes to next level as all these companies are planning to develop and developed the smart watches. 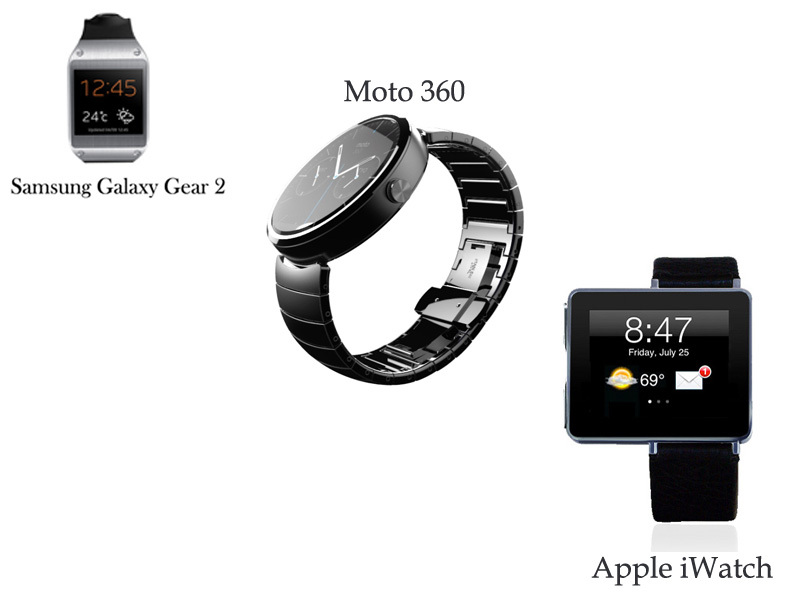 Here we are comparing the three smart-watches of these companies. Firstly start with name of the watches then Samsung named its watch Galaxy Gear 2, Moto 360 and Apple named its watch iwatch. We start with the Samsung Galaxy Gear 2, the watch has two versions that are Gear 2 and Gear 2 Neo. Gear 2 Neo is less costly than its sibling. Watch is powered with 1.0 GHz Dual Core Processor and 512 MB RAM, it has 1.63 inch super AMOLED display run on Tizen OS which is open source OS from the Company itself. It also has 4 GB internal memory and 2 MP camera on Gear 2 but no camera support in Gear 2 Neo. Power department is handled by 300 mAh battery which gives backup of 2-3 days in normal usage and up-to 6 days backup in low usage. Watch also provided with health services like Heart Rate Sensor, Pedometer, Sleep and Stress app. Finally the price of the watch, Galaxy Gear 2 cost about 21900 INR and while on the other hand Gear 2 Neo comes with less price of 15900 INR. Moto 360 is round shaped smartwatch, first of its kind as previously smartwatches comes with rectangular screens and frames. Company has yet not launched the watch but released its first view on its dedicated website. The Moto 360 comes with circular shaped dial with swappable band or straps, as there are two options with the bands that are with metallic finish and with leather finish. Watch comes with a 1.8 inch diameter screen display with OLED touch. Watch has features like auto orientation for ambidexterity, stainless steel, water and dust resistant. It will run with Android 4.3 and other newer versions. It is expected that watch will be launched in summer of 2014. Apple iwatch is the most rumoured gadget after IPhone 6. In a leaked memo of company’s CEO, claimed that year 2014 is a year of ‘big plans’. Company is planning to launch its newer version of IPhone and ipads and also willing to launch the iwatch as company’s officials trademarked this name. According to news website, company is planning to launch Iphone 6 and iwatch together in the fall of 2014. Size of the watch is 1.52 inch with OLED or PLED screen, it also features Bluetooth, changeable straps, pulse rate, heart rate monitor and 100 % water and dust resistant. Company also in talk with Switzerland based watch manufacturing company to make the iwatch more attractive and stylish. There are lots of rumours about the price of the smartwatch but it is expected that it should be around 15000 and 18000 INR.